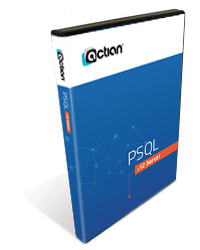 Note: The End of General Availability for PSQL v12 was June 30, 2018. We have only a limited number of base licenses in stock, so please buy Zen v13 Workgroup if possible, as this will also save you some money. PSQL Workgroup Engine licensing can be tricky at times. Please read this entire page before ordering! The Actian PSQL v12 Workgroup Engine is designed for smaller networks (up to 5 concurrent users) and single-user installations. Each engine license can be installed to ONE server or workstation at a time, and should be licensed based on the number of concurrent computers that will be sharing access to the data on that system. All other workstations in the workgroup get the free PSQL Client installed and need not be licensed. Note that if you are attempting to license multiple, individual, stand-alone workstations, then you need to order that number of 1-User Workgroup Licenses, and NOT a multi-user license -- they are not interchangeable with each other. The 32-bit Workgroup Engine license is available in three user counts, 1, 3, and 5. Separate User Count Increase licenses are available in +1 and +2 users and may be added to an existing engine to increase its total user count (to a maximum of 5). If you expect to need more than 5 concurrent users in the near future, please look at the Server Engine instead, which starts at 6 users and can go up from there. Actian provides no direct upgrade path from the Workgroup Engine to the Server Engine, so you'll want to choose carefully. (Of course, you can always use the Workgroup Engine on a laptop or backup server). If you believe that you need the extra power and performance of a 64-bit Server Engine or the backup capabilities of the Backup Agent or VSS Writer, but you only need one concurrent user (i.e. a standalone environment), then you may wish to consider the PSQL v12 Server Standalone license. For multi-user 64-bit environments, there is also the full PSQL v12 Server Engine. You can get more details about this product from our product page. If you are not sure which license you need, please try our new Product Selector now, or call to discuss it with us first! Please note that this license is for a standalone machine ONLY. If you need to add users to an existing PSQL v12 Workgroup, you will need a User Count Increase instead. Please note that this license is for adding users to an existing PSQL v12 Workgroup Engine ONLY. If you need to to license a standalone machine, you will need a Base license (above) instead.